The leading local supplier of Gold Coast sheds. Excalibur Steel Buildings has been based on the Gold Coast since we started in 2001. Centrally located in Mudgeeraba, we cover every suburb as well as surrounding areas. The Gold Coast hinterland is particularly well suited, including Mudgeeraba, Nerang, Worongary, Tallai, Bonogin, Gilston, Beechmont and Springbrook. We also service Canungra and Beaudesert. For many years, we have helped many people achieve the best shed for their needs in the local area. As well as helping people with domestic sheds and garages, we are also a major supplier of rural sheds and large sheds to local community groups such as the rural fire brigade. Many branches now have decent sheds that enable them to best fight bush fires and save people’s homes. If you are a business owner or have a need for a commercial or industrial shed, we can also supply a building that fits your exact purpose. Other large sheds that can be supplied include aircraft hangers, horse stables and various farming structures for packing and machinery etc. We believe that every shed is different because it needs to suit the person’s needs as much as possible. Commonly known sizes can be done of course, but if you need different designs or configurations of sheds, we can help you with that as well. We are one of the very few companies that can supply different types of construction. Most sheds are designed as what the industry call a portal frame design, where the building has open type trusses (no bottom chord), and frames are spaced apart at certain intervals. This is a very efficient way of building. But you can also buy stud framed sheds from us at a competitive price. These are very similar to your house in construction. They allow you to internally sheet the shed much easier. You can also use different types of wall sheeting to get a different look or to better match your house. Some of the uses for sheds supplied have been as storage sheds, workshop sheds, commercial sheds, barn, farm sheds as well as sheds for rural fire brigade and local schools. We also cater for a range of shed garages. Colorbond sheds are what are mostly asked for, but Zincalume sheds are also available (or part Colorbond, part Zincalume). The sheds come with every part and component you need to complete it. This includes the frame, roof, walls, connecting brackets, fasteners, guttering and downpipes. There’s also a full range of roller doors, PA (Personal Access) doors and windows available. Roof and wall insulation and whirlybirds can be supplied as well. Light and Heavy duty mezzanine floors & stairs can also be done. With a major manufacturing plant nearby and a Branch at Tweed Heads, all jobs are made and supplied locally. We use and recommend steel from Bluescope Lysaght for a strong, quality product. All the sheds include current site specific engineering to comply with standards and codes, and ready for council application/acceptance. For more information contact the Gold Coast City council, under building and planning, or you can use a private building certifier who will do the work for you. Our head office is located at 1b/75 Railway Street, Mudgeeraba QLD 4213 so if you are looking for a shed company that knows what they’re doing, please feel free to come in and tell us what you need. Otherwise, we are also happy to meet with you on site, to see what will work best on your property. As mentioned above, we supply sheds to all areas and suburbs of the Gold Coast as well as the Hinterland. This includes Advancetown, Alberton, Arundel, Ashmore, Austinville, Beechmont, Benowa, Biggera Waters, Bilinga, Bonogin, Broadbeach, Broadbeach Waters, Bundall, Burleigh Heads, Burleigh Waters, Carrara, Cedar Creek (part), Clagiraba, Clear Island Waters, Coolangatta, Coombabah, Coomera, Currumbin, Currumbin Valley, Currumbin Waters, Elanora, Gaven, Gilberton, Gilston, Guanaba, Helensvale, Highland Park, Hollywell, Hope Island, Jacobs Well, Kingsholme, Labrador, Lower Beechmont, Luscombe, Main Beach, Maudsland, Mermaid Beach, Mermaid Waters, Merrimac, Miami, Molendinar, Mount Nathan, Mount Tamborine, Mudgeeraba, Natural Bridge, Nerang, Neranwood, Norwell, Numinbah Valley, Ormeau, Ormeau Hills, Oxenford, Pacific Pines, Palm Beach, Paradise Point, Parkwood, Pimpama, Reedy Creek, Robina, Runaway Bay, South Stradbroke, Southport, Southern Moreton Bay Islands, Springbrook, Stapylton, Steiglitz, Surfers Paradise, Tallai, Tallebudgera, Tallebudgera Valley, Tamborine, Tugun, Upper Beechmont, Upper Coomera, Varsity Lakes, Willow Vale, Wongawallan, Woongoolba, Worongary and Yatala. What wind region are we in on the Gold Coast area? It can vary in certain spots, but it is mainly what they call wind region ‘B’ or ‘N3’. As mentioned before, there can be certain sites which face slightly higher winds. The next category up is “N4′ which is very similar to a region ‘C’ or ‘C2’ cyclonic region. Do I need council approval for my shed? In nearly every case, yes you will need to go through a application/approval process with your local governing body. This is mainly a building application, but can involve other parts, such as boundary relaxation, amenities & asthetics etc. With us, you have the choice of any of the colours in the Colorbond range, as well as Zincalume. You can also have multiple colours on your shed, not just one. So for example, you might one colour for the roof, one for the walls, one for the trim (guttering, flashings etc). Are all sheds the same or similar, regardless of where you buy them from? The short answer to this is no, they are not. Like many other things you can buy, some are made purely to a price and some are made more with quality in mind, with price considered as well. The challenge for you unfortunately is figuring out what is a good shed and what is not. The difference usually lies in the strength of the building and the quality of the steel and finish. When looking to buy a shed, ask about the weight of the shed (ie. how much steel is in it). This is an indication of the strength and design. Ask where the steel is made. 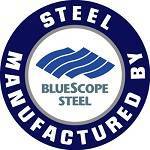 We believe that Australian made bluescope steel is the best for strength, longevity and finish. It is predominately high tensile (very strong), and go through rigorous research testing. It also need to pass the high Australian standards and building code. The Colorbond coating has been properly primed/etched and coated onto the base metal – if you have seen a faded roof with maybe some white patches on it, you can pretty sure it is not genuine Colorbond steel.